This digitally created piece was created by Bruno Cunha of Lago Dos Sonhos. 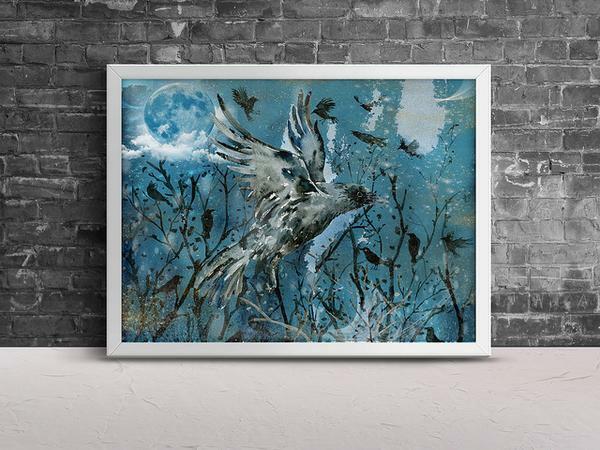 Featuring a main crow on a light night there are crows and a selection of digital painting and elements that have been added to this piece to making it a striking original piece of artwork. This piece creates a moody but interesting effect and will be striking hanging on any wall. Whether buying for yourself or as a gift for others it will be sure to be an eye catcher. Measures 8 x 10 inches in size and comes in a limited edition run of 10. When ordering the piece please leave the name you would like added to the certificate that accompanies the piece. The print will arrive unframed, ready to put into a frame of your choosing. I hope that you will love this piece as much as i enjoyed creating it!